The Dee’s Place team takes home the first place trophy at the 20th annual Special STARS Softball Classic on April 6. 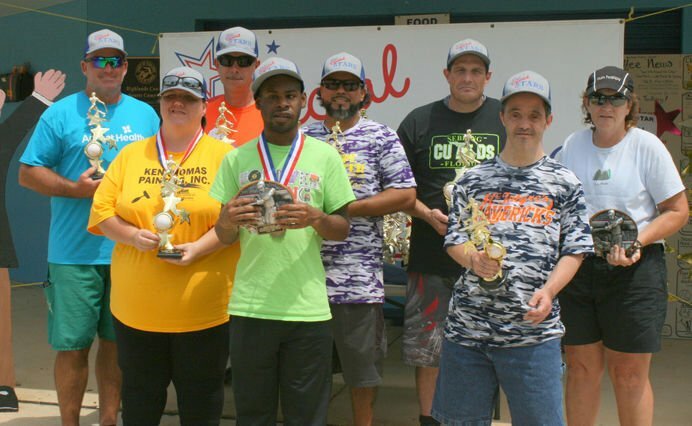 Several awards were presented to some top athletes at the 20th annual Special STARS Softball Classic on April 6 in Sebring. Winners were (front row, from left) Nikki Warner accepting the award for her coach Allison Lao, of Ken Thomas Painting Inc., who won the Best Coach award; DeQuawn Johnson, of Ken Thomas Painting Inc, who won Rookie of the Year; and John Smith, of McIntyre’s Mavericks, won Special Athlete Sportsmanship; Charlie Greer, of Advent Health, won the Best Community Partner; Cesar Martinez, of Coffee News, won Coach Sportsmanship; Juan Hernandez, of Lampe & Kiefer Hearing Aid Center, won Partner Sportsmanship; Brent Culbreth, of Dee’s Place, won Best Special Athlete; and umpire Jeanette Phipps won the Jonny “J.T.” Tanner Heart of Gold Award. Highlands County Sheriff’s Deputies carry in the torch on bicycle during the opening ceremony. Allison Lao, coach of the Ken Thomas Painting Inc. team, pitches during the game. Advent Health player Erin McCarta stands in the on deck circle while her team plays Coffee News of FLA.
SEBRING – In observation of 20 years of providing softball to athletes with disabilities in the Highlands, Hardee and southern Polk counties, the Highlands County Sheriff’s Department ushered in the torch during the opening ceremony at the Special STARS Softball Classic last Saturday. 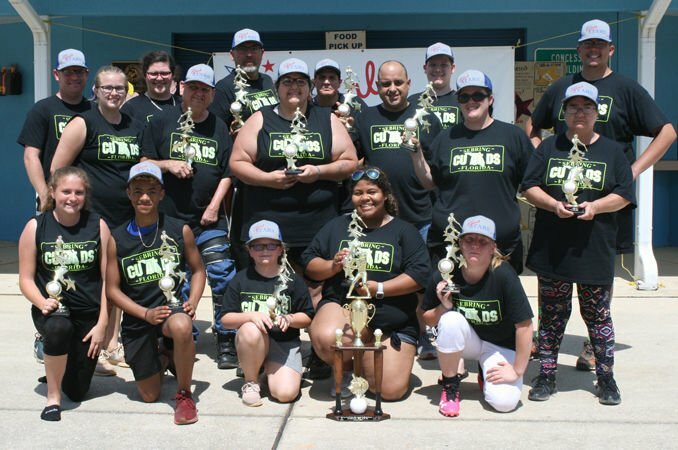 It was a day of celebration and joyful emotions as partners in the community played a coed softball tournament with athletes with special needs at the Highlands County Sports Complex. The coaches and partners in the community spent three weeks training the athletes for this big day on the field. “These special people have taught us so much,” said Mara Hernandez, a player with the Lampe & Kiefer Hearing Aid team and representative of the Children of Love Foundation, who did the opening prayer. “This has been a very humbling experience that has touched my heart,” she finished saying before she broke down in tears. Lampe & Kiefer Hearing Aid lost in the third place round against McIntyre’s Mavericks, sponsored by Raymond and Becky McIntyre, with a 9-7 score. While McIntyre’s team took the third place trophy, Coffee News of FLA won the second place trophy after being defeated in the championship round by Dee’s Place 11-4. Dee’s Place will be going to a Tampa Bay Rays game in August as part of their winnings. Other teams playing were Advent Health and Ken Thomas Painting Inc.
One of the top honors given at the tournament is the Jonny “J.T.” Tanner Heart of Gold award. This award goes to an individual who goes beyond the ball field to reach out to people with disabilities to make them feel loved, appreciated and above all respected. Tanner started this award three years ago when he reached out to be a friend with special athlete William Dickson. Tanner was tragically killed while walking along DeSoto Road in Sebring but his legacy of compassion lives on with this award. This year’s recipient of the Heart of Gold award was Jeanette Phipps of Avon Park who is the head official who organizes all the umpires for the tournament. Phipps has been a part of the softball tourney from the beginning as a player, donor and now a leader on the field. She has also assisted with other sports in Special STARS such as track and field and kickball. Her brother Jimmy participates in the program and she often joins her family on the sideline cheering him to victory. Phipps went beyond the ball field helping people with disabilities by cooking hot meals during Hurricane Irma and supporting the Aktion Club, a civic club consisting of adults with disabilities, in various projects in the community. Another top award that was given was the Joe Singha Memorial Rookie of the Year award and it was presented to DeQuawn Johnson, of Sebring, who played softball for his first year. He played on Ken Thomas Painting Inc.’s team. The coaches and partners in the community chose the winner of this award. The umpires selected the best players, coaches and partners as well as giving sportsmanship awards. Allison Lao, of Ken Thomas Painting Inc., won the Best Coach award; Cesar Martinez, of Coffee News, won Coach Sportsmanship; Charlie Greer, of Advent Health, won the Best Community Partner; Juan Hernandez, of Lampe & Kiefer Hearing Aid Center, won Partner Sportsmanship; Brent Culbreth, of Dee’s Place, won Best Special Athlete; and John Smith, of McIntyre’s Mavericks, won Special Athlete Sportsmanship. Law enforcement added a special touch to this year’s opening ceremony. As players lined the entrance to the ball fields, law enforcement carried in the torch by bicycle followed by squad cars flashing their lights. Deputy Jeff Turner and his bloodhound Hooch were there to meet and greet the athletes. Highlands County Sheriff Paul Blackman was also present during the opening. Local resident and singer Carl Gillilan sang the national anthem as Jackie Card signed the song. The first pitch was thrown out by Kinlee Brown, representing the Joe Singha family, and Jan Funk, with the Sebring Elks Lodge 1529. J & J Angels sponsored the 13 players competing in softball skills. They competed for trophies for throwing, fielding, batting and running the bases. Skill level participants getting first place were C.J. Chandler, Sondra Jones, Bryan Bishop and Herb Adkins. Second place winners were Dasan Jordon, Tammy Furman, Carl Smith and Cheryl Moore. Third place winners were Astyn Welch, Sue Talios, Fred Moore and Jeannene Eby. The Joe Singha Family, Sebring Elks Lodge 1529, Tamara Anna Memorial Fund, Highlands Sertoma Club, Coffee News of FLA, Hendrix Lawn, J&J Angels, Germaine Surveying and Highlands County Board of County Commissioners were the All Star sponsors. In addition to the team sponsors, others making donations included Stephenson-Nelson Funeral Home, Center State Bank, Dr. Rebecca Singha, Roberta Creech, Chris Tolar, and 64 West Collision Repair Inc. These donors helped Special STARS collect more than $7,000 to assist special athletes in this community throughout the year. Special STARS provides 14 different sports and eight recreational activities throughout the year for more than 400 athletes with physical and mental disabilities.